Vote • If lead holds, ex-legislator will become state's first openly gay mayor. 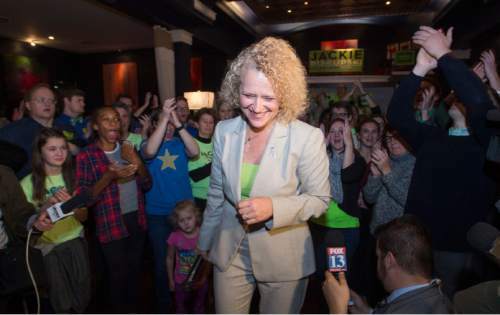 Steve Griffin | The Salt Lake Tribune Jackie Biskupski's talks to her supporters after late lection results came in during her election night gathering at Kimi's Chop House in Salt Lake City, Tuesday, November 3, 2015. 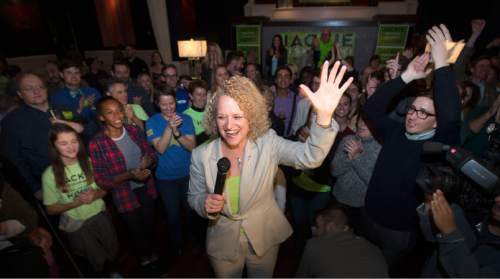 Steve Griffin | The Salt Lake Tribune Jackie Biskupski's talks to her supporters after late lection results came in during her election night gathering at Kimi's Chop House in Salt Lake City, Tuesday, November 3, 2015. Leah Hogsten | The Salt Lake Tribune "I remain hopeful that I'll have the opportunity to continue serving as mayor," said Ralph Becker, declaring the race too close to call for the evening. 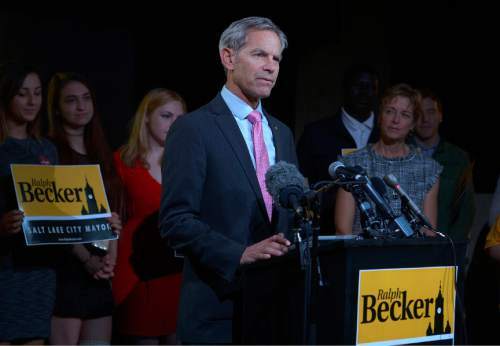 Becker, the two-term incumbent thanked all of his campaign supports and staff in the Salt Lake City mayoral race against former legislator Jackie Biskupski, Tuesday, November 3, 2015. Steve Griffin | The Salt Lake Tribune Jackie Biskupski's hugs her son Archie after seeing election results for the first time at her election night gathering at Kimi's Chop House in Salt Lake City, Tuesday, November 3, 2015. 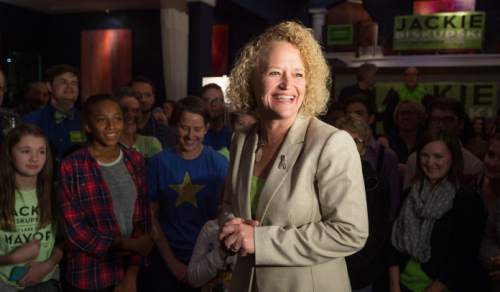 Steve Griffin | The Salt Lake Tribune Jackie Biskupski's talks to her supporters after late lection results came in during her election night gathering at Kimi's Chop House in Salt Lake City, Tuesday, November 3, 2015. Steve Griffin | The Salt Lake Tribune Jackie Biskupski's raises her arms and screams with excitement as she sees election results for the first time at her election night gathering at Kimi's Chop House in Salt Lake City, Tuesday, November 3, 2015. 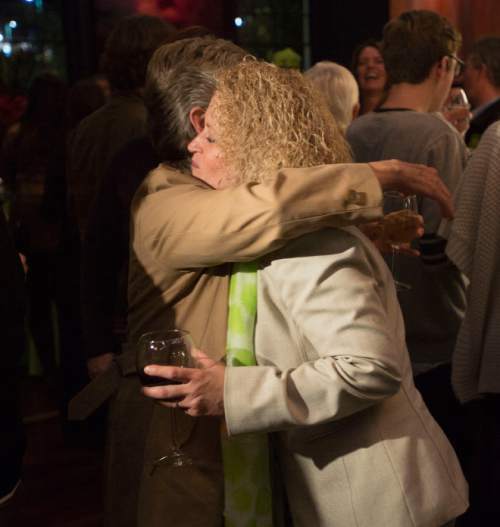 Steve Griffin | The Salt Lake Tribune Salt Lake City mayoral candidate Jackie Biskupski's hugs supporters during election night gathering at Kimi's Chop House in Salt Lake City, Tuesday, November 3, 2015. Steve Griffin | The Salt Lake Tribune Salt Lake City mayoral candidate Jackie Biskupski's shakes hands with supporters during election night gathering at Kimi's Chop House in Salt Lake City, Tuesday, November 3, 2015. Steve Griffin | The Salt Lake Tribune Jackie Biskupski's hugs her son Archie after seeing election results for the first time at her election night gathering at Kimi's Chop House in Salt Lake City, Tuesday, November 3, 2015. Steve Griffin | The Salt Lake Tribune Jackie Biskupski's smiles as she talks with reporters after seeing election results for the first time at her election night gathering at Kimi's Chop House in Salt Lake City, Tuesday, November 3, 2015. 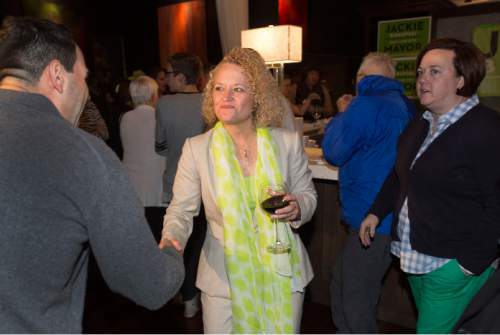 Steve Griffin | The Salt Lake Tribune Jackie Biskupski's talks to her supporters after late lection results came in during her election night gathering at Kimi's Chop House in Salt Lake City, Tuesday, November 3, 2015. Leah Hogsten | The Salt Lake Tribune "I remain hopeful that I'll have the opportunity to continue serving as mayor," said Ralph Becker, declaring the race too close to call for the evening. 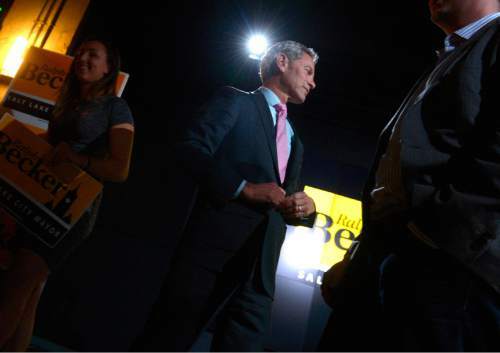 Becker, the two-term incumbent thanked all of his campaign supports and staff in the Salt Lake City mayoral race against former legislator Jackie Biskupski, Tuesday, November 3, 2015. Leah Hogsten | The Salt Lake Tribune "I remain hopeful that I'll have the opportunity to continue serving as mayor," said Ralph Becker, declaring the race too close to call for the evening. 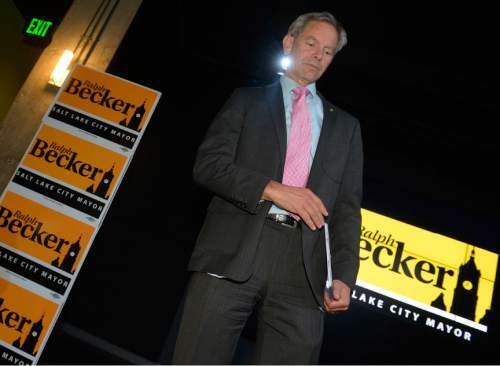 Becker, the two-term incumbent thanked all of his campaign supports and staff in the Salt Lake City mayoral race against former legislator Jackie Biskupski, Tuesday, November 3, 2015. 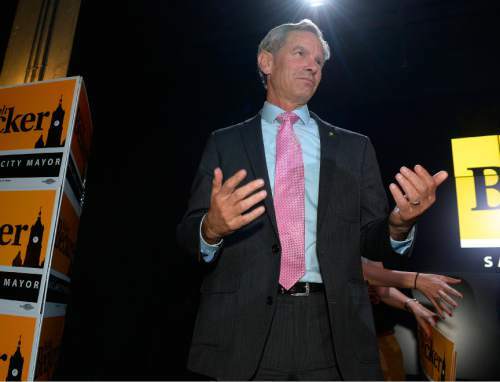 Leah Hogsten | The Salt Lake Tribune "I remain hopeful that I'll have the opportunity to continue serving as mayor," said Ralph Becker, declaring the race too close to call for the evening. 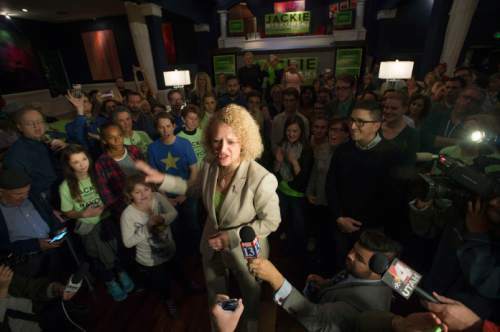 Becker, the two-term incumbent thanked all of his campaign supports and staff in the Salt Lake City mayoral race against former legislator Jackie Biskupski, Tuesday, November 3, 2015. Salt Lake City voters elected Jackie Biskupski as Utah&apos;s first openly gay city mayor and only the second female top executive in the capital city, according to the unofficial election-night count. Those vote tallies had Biskupski with 52.19 percent to two-term Mayor Ralph Becker&apos;s 47.81 percent  less than a 5 percentage-point spread. No additional results will be released until the Nov. 17 canvass. Becker did not concede Tuesday night but did compliment Biskupski on a hard-fought campaign. "I commend her, and really I&apos;ve felt this way, she&apos;s run a very, very strong campaign. And the votes that have been counted so far show her in the lead, and it&apos;s a reflection of the campaign she&apos;s run, and I commend her for that," the mayor said. "Beyond that, I think we&apos;re going to have to wait and see what the final votes are." As of Tuesday evening, the Salt Lake County Clerk&apos;s office had received mail-in ballots from 48.4 percent of registered Salt Lake City voters. That record most likely will go higher, said County Clerk Sherrie Swensen, when all ballots are collected. "I feel great," Biskupski said. "We maintained that lead we had, and we&apos;re going to finish strong, I know it." Biskupski expects to be victorious, she said, even though the results are preliminary. "It&apos;s about all these people in this room. Look at the people in this room," Biskupski said of the crowd of about 200 people gathered at Kimi&apos;s Chop House restaurant in Sugar House. "This is a diverse group of people from all over the city. This is about having a voice again." "Generations of LGBT people could&apos;ve only dreamed of this," he said. "Jackie is now an iconic gay leader. This is a great moment for Salt Lake City  we&apos;re not the stereotype people across the country think we are." Still Becker&apos;s camp was holding out hope, according to campaign manager Matt Lyon. "Look, we came from a primary that was really far behind. We&apos;re now within 1,500 votes," he said, noting that more ballots remain to be counted. "We think it&apos;s going to be a close election." Biskupski, a former state legislator, was apparently able to hold on to a lead in the fall campaign despite a vigorous effort by the two-term mayor, who spent more than $863,000 and garnered a passel of endorsements from top Democrats  and Republicans, such as former Gov. Mike Leavitt and former Sen. Bob Bennett  as well as five Salt Lake City Council members. He also used his incumbency to call news conferences celebrating events related to community gardens, the 28th anniversary of the redevelopment agency in Sugar House and other things. But Biskupski&apos;s grass-roots campaign focused on change at City Hall and kept its momentum by painting her as the people&apos;s candidate who would listen to constituents. In the Aug. 11 primary, Biskupski captured 46 percent to Becker&apos;s 31 percent. Three other candidates garnered a total of 19 percent. She spent more than $536,000 and had help from a political action committee affiliated with Reagan Outdoor Advertising that put up more than a dozen billboards supporting her candidacy. Reagan donated its billboards outside campaign contribution caps through a political action committee, and billboards became one of the few issues where Becker got traction against his opponent. Biskupski, who for the past eight years has been a top adviser for Salt Lake County Sheriff Jim Winder, got the backing of organized labor, including the Salt Lake Police Association. The most noteworthy event in the campaign came in June, when Becker forced the resignation of popular police Chief Chris Burbank. That action came after three female officers filed notice of claim with Salt Lake City, signaling their intent to sue over sexual harassment from former Deputy Chief Rick Findlay. The allegations were substantiated by January 2014. Burbank put Findlay on administrative leave, and the former deputy chief was allowed to retire with full benefits in June 2014. Becker insisted Burbank&apos;s ouster was not political. But Biskupski said the mayor waited a year to act and did so only after the women filed suit and the issue became campaign fodder. The women&apos;s lawsuit was settled last month. Central to Becker&apos;s campaign is the economic upswing in Salt Lake City&apos;s economy and a building boom that mirrors a new vibrancy downtown. During the campaign, he launched a new economic-development program and hailed achievements, such as the new public safety building, a municipal solar farm and the Eccles Theater going up on Main Street. But for some voters, the mayor&apos;s accomplishments  including the theater, new parking meters and protected bike lanes  were negatives. Biskupski chided the mayor for not putting the $120 million theater before voters and she noted that senior citizens stay away from downtown because of the new credit-card friendly parking kiosks. Further, attacking Becker&apos;s strength, Biskupski said the city was losing out on attracting new businesses that were landing in other Wasatch Front municipalities. Both candidates contended impact fees on new development were too high. But in September, Becker forwarded an initiative to the City Council to waive those fees for one year. The council recently passed the moratorium by a 4-2 vote. Biskupski pounced on the move, pointing to a proposed 492-unit Sugar House apartment complex. If approved by Nov. 2, 2016, the developer, Boulder Ventures, would save about $1.5 million. The last mayor elected to three terms in Salt Lake City was Ted Wilson in 1983. Two of three Salt Lake City Council races remained close Tuesday evening. In District 2, Andrew Johnston was leading former councilman Van Turner 51.99 percent to 48.41 percent in preliminary results. In District 4, Derek Kitchen had captured 51.69 percent of the preliminary vote count to 48.31 percent for Nate Salazar. And in District 6, incumbent Charlie Luke had a commanding 64.44 percent to 35.56 percent lead in the preliminary vote tally over challenger Tracey Harty.